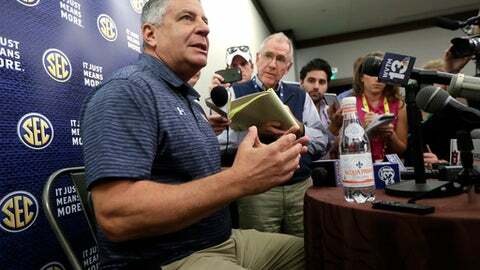 AUBURN, Ala. (AP) The Auburn Tigers approach the season with an uneasy mix of high hopes and high anxiety. The Tigers appeared poised for one of their best seasons in years, with a run at ending a 15-year NCAA Tournament drought seeming a realistic goal. Then the arrest of associate head coach Chuck Person on federal bribery and fraud charges left questions about whether any players would be ineligible at least to start the season. Coach Bruce Pearl and Auburn aren’t saying. Person was suspended without pay after prosecutors said the former NBA player accepted about $91,500 in bribes to steer clients to a Pittsburgh-based financial adviser when they turned pro. He allegedly paid some of that money to the families of two recruits, whose names haven’t been released by either investigators or Auburn. Person’s description of one recruit included in federal documents appeared to describe center Austin Wiley, a mid-year enrollee last season. Pearl insists he doesn’t know ”with absolute certainty” which players are being referenced. The lofty expectations that led to a September sellout of season tickets have been diminished for fans, a couple of hundred of whom opted for refunds. Pearl would like to reassure them that things are going to be OK.
”Practices are open. If they came out and watched us practice, I think they’d feel good about how hard the guys are working and what they’re seeing,” he said. ”We still have to work through an ongoing investigation, so there’s certainly going to be elements of uncertainty. He’s still expecting a ”phenomenal” turnout starting with Thursday night’s exhibition game against Barry. That exhibition could be most notable for which players, if any, are held out. It’s easily the most returning production Pearl has had since arriving in 2014 after an annual rebuilding process with the help of graduate transfers. WILEY’S STATUS: The 6-foot-11, 260-pounder suffered a stress fracture in his left leg playing for the U19 World Cup team in Cairo, Egypt, in July. Wiley has been hampered by issues with the leg and isn’t likely to play in the exhibition game whatever his eligibility status. Pearl said he expects Wiley to start doing some individual workouts this week. He averaged double digits in both scoring and rebounding for the U19 team. TALENTED SOPHOMORES: Most of the Tigers’ top players are sophomores, including leading scorer and rebounder Mustapha Heron, forward Danjel Purifoy, point guard Jared Harper and Wiley. Walk-on Patrick Keim is the only senior while juniors Bryce Brown and Horace Spencer could play significant roles, particularly if any teammate is ruled ineligible. RUNNING THE SHOW: Harper is back after being one of three double-digit scorers and leading the team with 95 assists. Freshman Davion Mitchell has been trying to mount a challenge during practice. SCHEDULE: Auburn’s nonconference schedule includes games at Dayton (Nov. 29), against Middle Tennessee (Dec. 16) in Birmingham and at Auburn Arena with UConn (Dec. 23). The Tigers also host Kentucky in February. PEARL’S TIME: The fourth-year Auburn coach has had a big rebuilding job. He has a 44-54 record with the Tigers but still ranks second among active SEC coaches with a 71.8 percent winning percentage behind Kentucky’s John Calipari. He has led 18 of his 22 teams to the postseason, but hasn’t gotten Auburn to even the NIT yet.